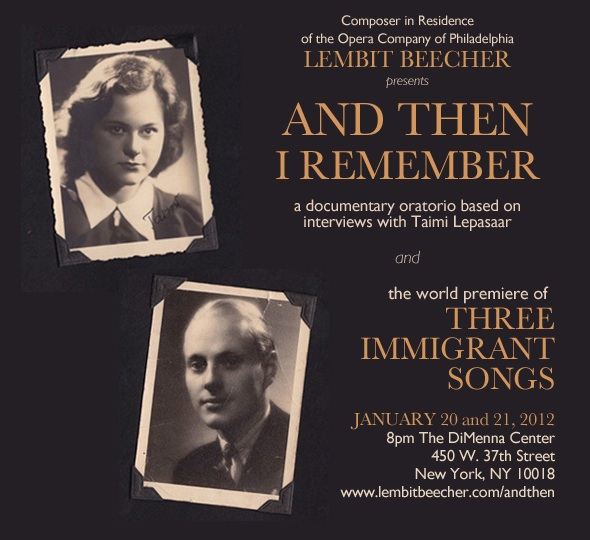 A concert featuring the New York premiere of And Then I Remember, the world premiere of Three Immigrant Songs and music by Veljo Tormis, performed at the DiMenna Center in NYC on January 20 and 21, 2012. My grandmother, Taimi Lepasaar, came to the United States in 1949 accompanied by her two daughters (including my seven-year-old mother) and her parents. She had been born in Estonia in 1922, escaped as the Soviet Army was invading for a second time in 1944, and spent five years in displaced person camps in Western Europe in the aftermath of World War II. Though I grew up in California, Estonian was my first language and Estonia had a strong, almost legendary presence in my childhood. A central part of this presence were the stories that my grandmother told me of her childhood, coming of age during the war, and immigration to the United States. So many of us in this country have similar stories, whether it was our parents or our great- great-grandparents who first came to America. My experience listening to my grandmother made me particularly aware of the way that the immigrant experience stays with families and communities across generations through stories and legends, values and world view. And though the pieces on this program share similar themes—they all deal with the idea of home and what it means to be separated from one’s homeland—I think my inspiration for writing this music stems as much from my interest in storytelling as it does from the thematic elements. A preview article in Arts America by Daniel Kushner.